Directions: Drive to Denver Museum of Nature and Science and go to top stairs of the museum facing Ferril Lake you will see the Denver Skyline with Mountain facing view. 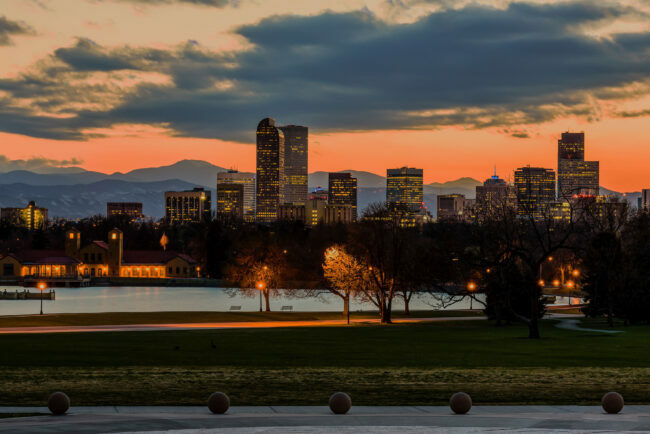 I have been in search of good location to shoot Denver Skyline with Mountains/Sunsets and found this place when I was shooting birds in City Park from a fellow photographer. The stair top gives you nice vantage point, I noticed if you could go in the museum there is a rooftop patio which should give even better point to get the skyline and mountains. From this location your wide angle lens is not going to give the depth of field and compression for the mountains plus the skyline is bit far. I would go with 70-200 or 85mm, 105mm or 135mm primes for vertical panorama. The featured image I shot is with 70-200mm at 122mm, f/11.0, ISO 125 for 3 seconds. This location is also one of the best inside the city for birding, there is a small island in Ferril Lake with trees filled with different species of birds. So bring in your long telephoto to capture some birds. I would like to use your photo in a print piece for the City of Denver. Is that possible and is a high resolution full page 300 dpi image available? Hello – this is a gorgeous photo. What is your usage policy, please? I’m interested in using this shot in a small section of a multi-picture CRT shot. Thanks so much for your reply. Sorry for late reply, do you still need to license this image? Somewhat novice photographer moving to Denver in 8 days/in search of a good place to shoot sunsets, and I believe I found it :) Thank you! Oh and btw: gorgeous shot! John, love the photo, would I be able to use it as a background in a local publication highlighting “Outstanding Women in Business”. ? Hi Norman, Do you still need to license image? Looking to get a license to use this photo – Its a fantastic shot. Please let me know what you charge. Gorgeous image, could you send me information to use your image for a small company in Denver? Thank you.